I am so behind in everything lately and posting is one of them. 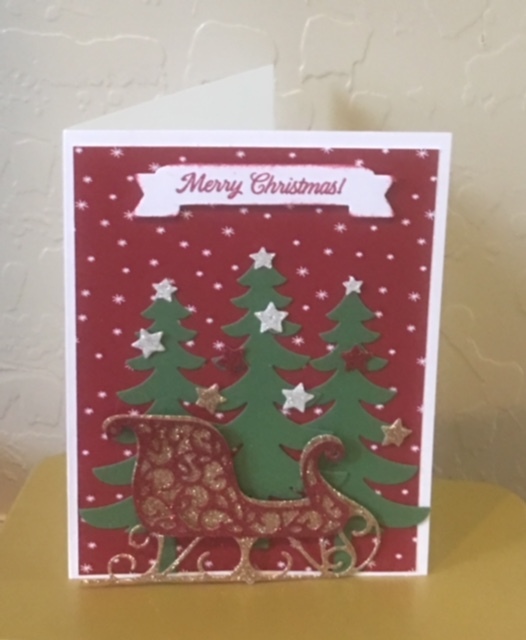 I am going to start with a card I made for my Great Grandson Elijah. He will turn 3 next week and his card is in the mail. So I don't think he will mind if I share it with all of you. 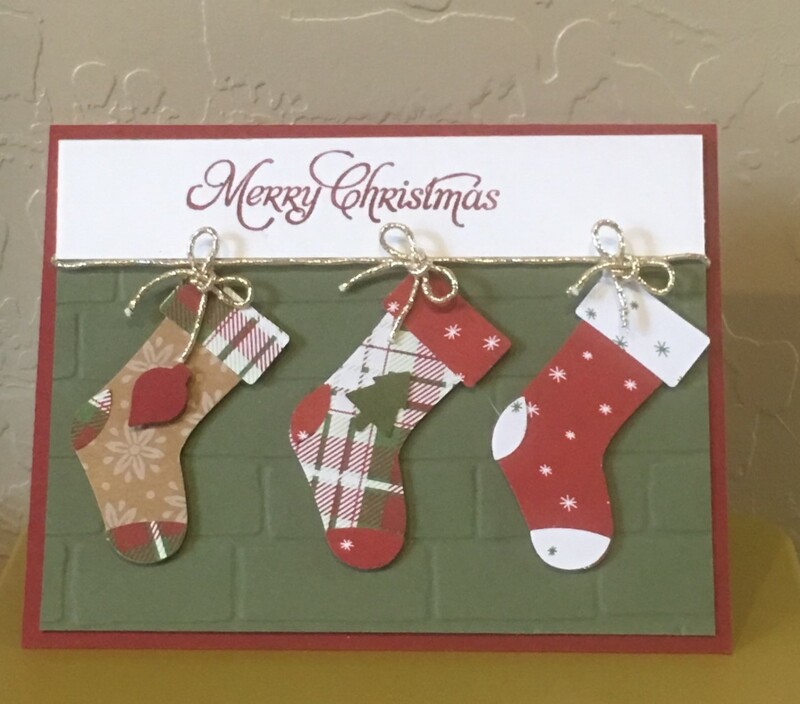 I just love this set from Stampin up, No bones about it. 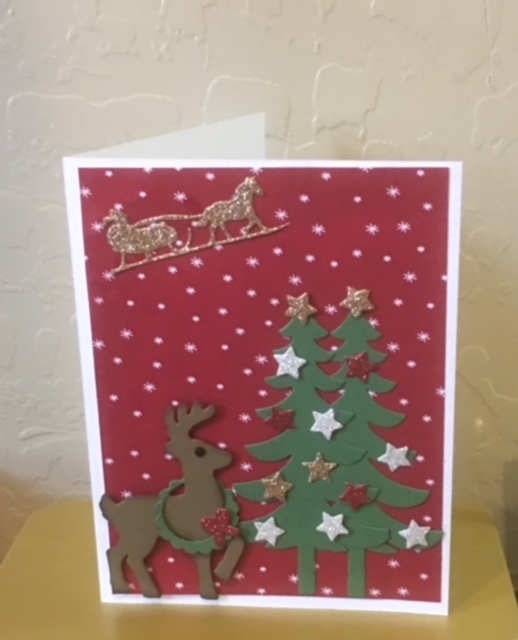 It is just great for making cards for boys. It was quick and easy. Copied from Pinterest. 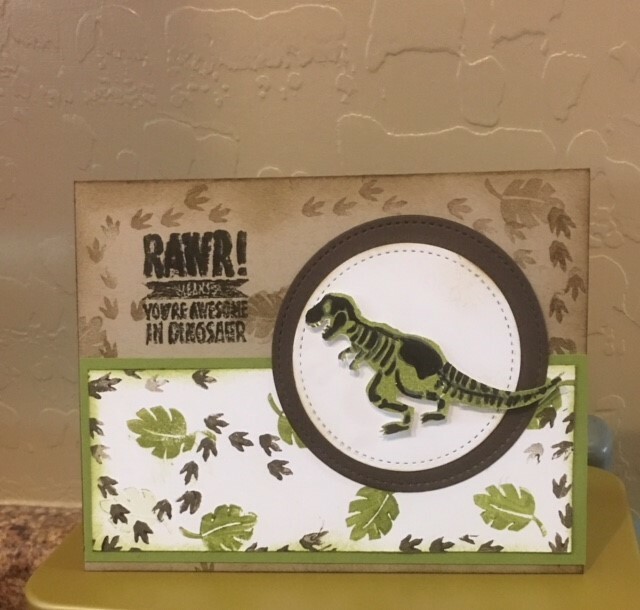 I made my own Designer paper to go with the theme. Here are some of my Favorite cards this year. 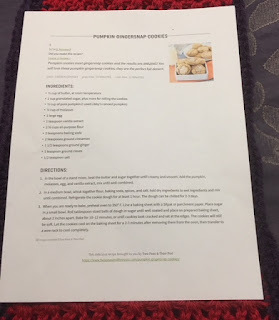 So quick and simple. 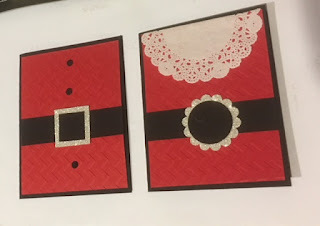 I just love my Mr. and Mrs. Claus cards, I saw them on Pinterest and just had to make them. This I cased from my sister. Besides baking I love making Christmas cards, bags and boxes. 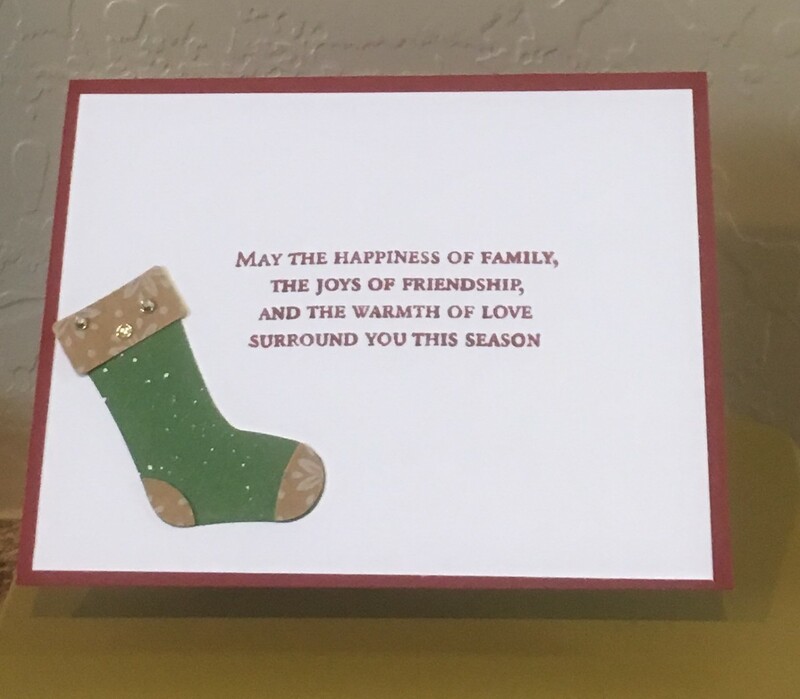 As I have said before I love everything about Christmas and the Holidays. 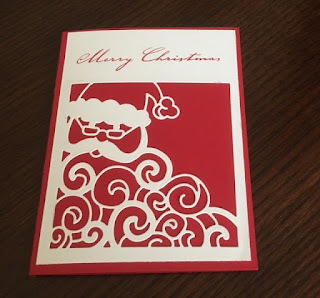 Here are some of the other cards I made this year. Today is the last day of my Twelve Days of Christmas projects. 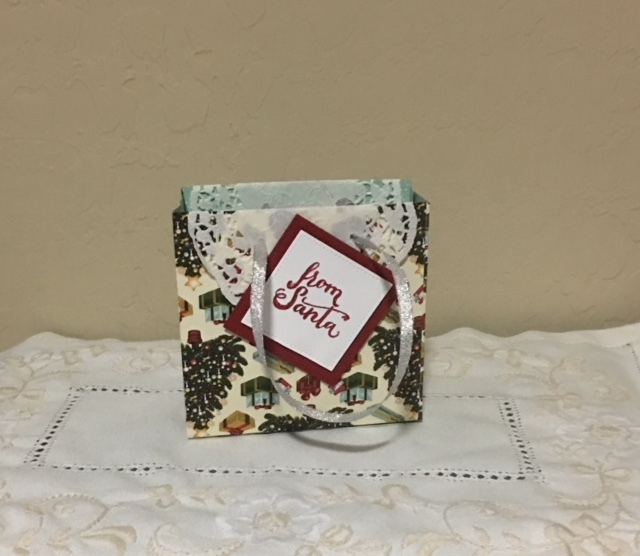 I love making gift bags for my friends and family. So Christmas is no different. I used Stampin up Gift Bag Punch Board. Todays gift bag is an extra large bag I made to hold a Christmas ornament for my Vegas Red Hat Diva's Christmas Cookie Recipe Swap. More that later. 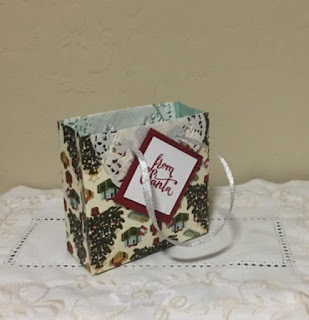 I searched you tube last year looking for a way to make large and extra large gift bags and found several. The one I found to be the most helpful was Tuppence Coloured: In the bag and here is her link http://2dcoloured.blogspot.com/2015/06/in-bag.html . 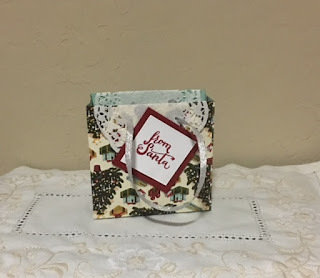 These gift bags are very easy to make, and what a way to use retired DSP. I hope you have enjoyed this years Twelve Days of Christmas. 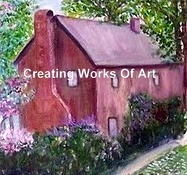 Leave me a comment on any one or all of the projects. This year I combined cookies we all love Pumpkin and Ginger Snaps. Everyone loved them at the Christmas party, so I hope you will too. For today I did a set of 3 cards. I make so many cards each year and sometimes fast easy cards are a blessing. Today cards is a bit different. 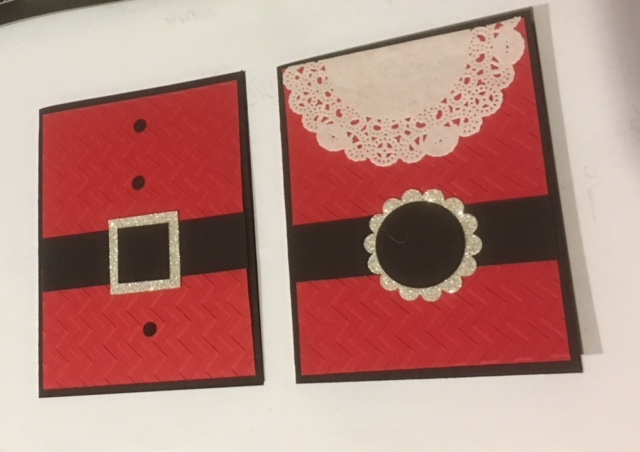 My sister and I made the same card two different ways. What I would like you to decided is which one did I make? They are beautiful cards and my sister did a great job of designing them. We decorated with Rhinestone to add a little Sparkle.